I am 28 years old and grew up here in Norwich, Connecticut a region most popular for having two of the largest casinos in the world but better known to the railroad industry as home of the first railroad tunnel built in the U.S. located just two miles away in Lisbon, Ct on the Providence & Worcester line. My lovely fianc�e Angela, beautiful daughter Lynette and I bought our home in November 2003. Unlike the majority of model railroaders as a young child I never had any model trains to play with but my love for trains traces back to the childhood days living in New London, Ct. just 15 miles south of Norwich. I lived right beside the New London Amtrak train Station. I remember seeing Amtraks F40�s and P&Ws various engines going by a few times a day and I liked that. When I was about 22 years old I found myself in a popular toy store and I saw two different sets of Bachmann train sets. That immediately sent my memories back to the days next to the Amtrak Station and I wanted to build a train layout. So I purchased both sets for about $75, brought them back home to my bedroom since I still lived with my parents. I proudly built this 4�x 8� beginners� layout in a matter of a couple of weeks. I must admit that it was a far cry away from looking realistic. I had an oval track with a figure 8 in the middle. 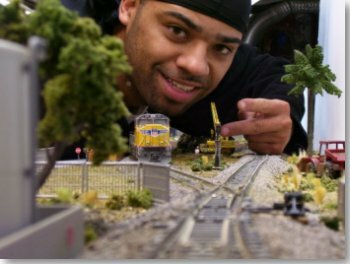 The scenery was very toy like and although the layout was not a masterpiece one thing it started was my love for the Union Pacific railroad because that is what the two sets came with. After a makeover of my house we moved in on December 15, 2003 and within a week I had purchased another model railroaders 4�x 9� layout but this time it was in my very own basement. That layout had the entire track laid and wired by the previous owner. He explained for a while how to operate it but I am going to be honest and say it made no sense to me because he was talking about switching polarities, turning on/off blocks and things of that sort. I bought it anyway and got it home to my basement. All I had to do was complete the scenery work. It took me approximately one month to finish it completely with a much better result than the previous toy like one I did a couple of years earlier. I was too overwhelmed with how this layout was supposed to be operated and the curves were way too tight for my 6 axle engines so I just simply decided to just sell it and start my very own layout from the bottom up this time.